Step 1 Heat the oven to 425 degrees and prick the sweet potatoes before placing them on a baking sheet and cooking them whole for about 1 hour, depending on their size. You want the flesh inside to be very soft, and no doubt the skin will be burnt in parts by the hot-roast syrup that can dribble out as they cook. This is good. Step 2 The minute the sweet potatoes are in the oven, cut the stalk end off the garlic, leaving the tips of the cloves exposed, and then wrap loosely in aluminum foil, sealing the ends tightly to form a baggy parcel, and roast with the sweet potatoes. This should probably be ready in 45 minutes, but I leave it for the hour with the sweet potatoes. Step 3Let the soft and tender sweet potato and garlic cool; you can do this ahead of time and refrigerate them wrapped in aluminum foil or in a covered container. Step 4When you are ready to prepare the dip, peel the skin gently away from the sweet potatoes and scoop out the orange pulpy flesh, leaving behind any of the scorched bits. Tip it all into a bowl and then squeeze in the soft, caramelized garlic purée from the exposed cloves. Step 5Add the finely grated zest from both limes, and the juice from one, the smoked salt, pimentón dulce, chickpeas, and finely grated ginger and then blitz with a stick blender (or use a food processor) to make your dip. This makes a scant 4 cups dip. Step 6Check the seasoning as well as acidity — you may want more lime juice — and serve, for beauty's sake, sprinkled with pomegranate seeds. In Recipes-list.com we have selected the most viewed recipes from category - Appetizers Sides . Enjoy the best recipes specially selected for you! 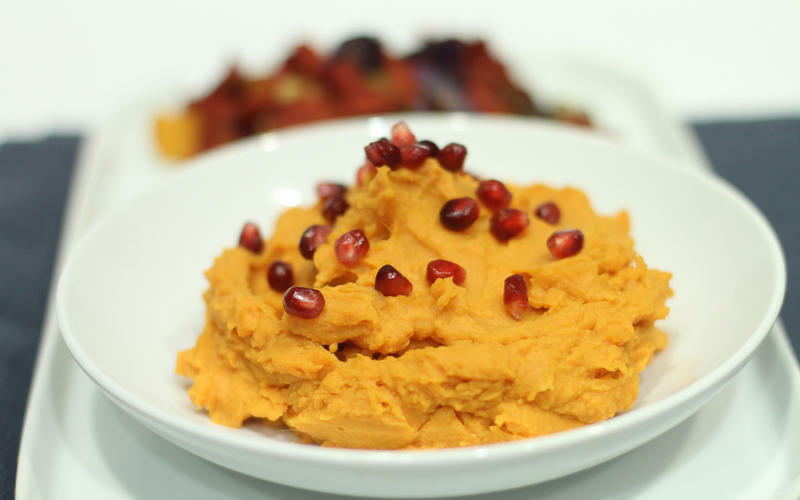 Sweet potato and chickpea dip is the right choice that will satisfy all your claims.